A scientist in Japan says he has discovered a better way to fool our eyes. Scientists are making new discoveries all the time. 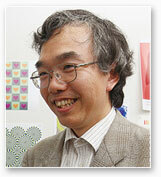 Professor Akiyoshi Kitaoka specialises in discovering how peripheral vision works … so that he can design optical illusions that outclass anything currently available.